Each time you visit the Site, we collect the limited information that your browser makes available whenever you visit any website. This information includes: (a) your Internet Protocol (IP) address; (b) the address of the last URL you visited before clicking through to the Site; (c) your browser and platform type (e.g., an IE browser on a Windows platform); (d) your browser language; and (e) the data in any undeleted "cookies" that your browser previously accepted from us. Additionally, when you enter a search query using the Site or Services, we will receive the query text and process it, together with the above data, to return a search results page to you. If you have modified your browser settings so that address-bar search queries and erroneous domain name system (DNS) requests are submitted to us, we may also receive any search query or misspelled URL that you enter into your browser's address bar. The Site and Services usually do not require registration or submission of an email address in order to use them. We use the information that we collect to improve the overall quality of your experience with the Site and Services, and to facilitate evaluation, improvement, and development of the Services. We aggregate query information for internal reporting purposes and optimization of advertising revenue. We count, track, and aggregate our visitors' activities in our analysis of general traffic flows at the Site (e.g., tracking where users come from, what pages they select within the Site, how they interact with search results, etc.). Do we take security precautions to protect your information? We have security measures in place that are designed to safeguard and help prevent unauthorized access to information we collect online. 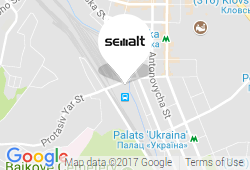 semalt.com utilizes both industry and proprietary standards to preserve the confidentiality of information. We seek to limit access to our users' information to employees who we believe reasonably need access to that information to provide products or services to you or in order to perform their jobs. These employees have been informed of the need to maintain the security and confidentiality of such information. Unfortunately, no security system can be 100% secure; accordingly, we cannot guarantee the security of the information that we collect online.